iOS gamers will soon finally have something to prove their handheld gaming dominance with the highly-anticipated Infinity Blade slated to hit the App Store on December 9th for $5.99. “I can’t believe this is on one of our devices” – Steve Jobs after seeing a tech demo of the game in action. The title is definitely by far the most graphically advanced game for iOS devices, using the same Unreal Engine technology used to create high-profile console games such as recent hits Batman: Arkham Asylum, Mass Effect 2, and Borderlands. A tech demo for the game was originally shown off by developer Chair Entertainment and parent company Epic Games (developer of Gears of War) at a special event held by Apple CEO Steve Jobs in September. The result of that demo is the Unreal Engine-powered Infinity Blade action RPG hitting the App Store next month. You can download the free tech demo, which is called “Epic Citadel” from the App Store now. 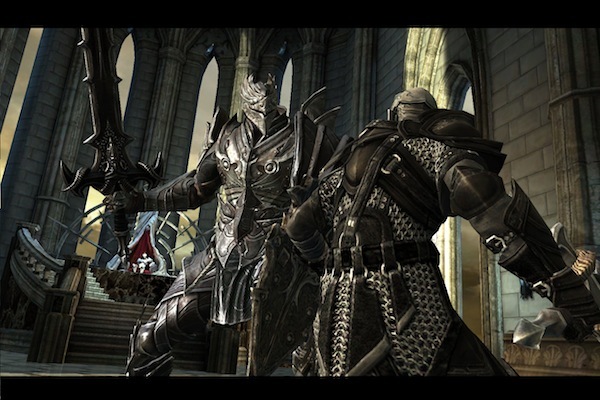 Infinity Blade ($5.99) will be available December 9th for iPhone 3GS, iPhone 4, 3rd generation iPod touch, and iPads running iOS 3.1.3 or higher. The official trailer for the title is above.